So said Reverend Canon Professor Patrick Comerford Patrick Comerford at the Church of Ireland Synod this month, where speakers discussed a faith-based approach to harmony between Travellers and settled people. The Priest-in-Charge of the Rathkeale and Kilnaughtin group of parishes spoke about the Rathkeale Pre-social Cohesion Project, a cause which is led by community development officer David Breen. The programme is a collaboration between the Catholic, Church of Ireland and Methodist churches, in association with West Limerick Resources, and the group holds prayer meetings and events in an effort to use faith to unite the communities. “If we are to describe life in Rathkeale as ‘apartheid’ we might be using a misnomer. There are two separate communities, and they seldom interact, even when they attend the same Mass,” said Canon Comerford. “But both communities have chosen this separation, have chosen to live apart. Even when they are sociable, they do not find true friends across the barrier,” he said. Coordinator David Breen explained why he approached religious clergy when the project started. “The majority of people living in Rathkeale are at least nominally Catholic, with the Travellers being extremely committed to church. However, the parish is a divided Eucharistic community, a situation that needed a faith response,” said Mr Breen. Canon Comerford said that the prayer group as part of the pre-social cohesion project gave the group “a conviction that a faith-based approach might offer some new opportunities of engagement”, added Canon Comerford. The Church of Ireland reverend and former journalist also cited the image of Rathkeale from the outside world, referencing some of the bad press Rathkeale has received in recent times, and explained his own interest in the project. “Lost sheep are not like the sheep in our stained-glass windows, modelled on the Little Lamb that Mary had and the followed her to school one day. “Lost sheep get caught in brambles, are frightened, get lost, are not particularly appealing to look at when they are found. But those who are not wanted, who are pushed to the margins, who are out of sight, are always worth the effort as far as the Good Shepherd is concerned,” he said. For an academic, finding you are referenced to in an important, major publication is almost as exciting as having your own work published. If it is positive, it can amount to recognition from your own peers, and it is even more exciting when it comes unexpectedly and in a field that you have a passion for. My academic role at the Church of Ireland Theological Institute is coming to an end after 15 years – an initial four years as a part-time or visiting lecturer, and the last 11 years as a full-time lecturer, with further recognition for the last six years from Trinity College Dublin as an adjunct assistant professor. There are still three dissertations to see through at their viva voce examinations and a court of examiners to attend, and the past few days have been busy, with final marking and second marking of some dissertations and essays. On Thursday evening, following the end-of-year Eucharist, there were presentations too from the faculty members, staff and student at CITI, which an emotional evening of recognition, thanks and some surprises. But as I was travelling from Limerick to Dublin, I stumbled across another surprising recognition in an unexpected place. For some time, I have delighted to work my way through the scholarly, landmark edition of TS Eliot’s poems edited by Christopher Ricks and Jim McCue, and published by Faber & Faber in two volumes in 2015. They were given as a very special present some time ago. ‘These fragments I have shored against my ruins,’ Eliot writes at the end of The Waste Land. 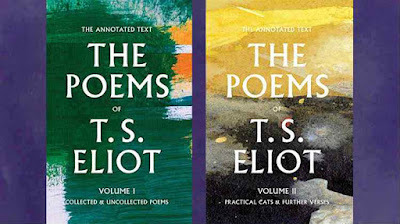 Eliot once appeared to set his face against scholarship, saying in 1962: ‘I will not allow any academic critic … to provide notes of explanation to be published with any of my poems.’ The editors of this new collection trace how Eliot went about developing his poetic voice, but are careful to explains that their work is not critical as such. It was an exchange I had forgotten about, which added to the surprise and delight of coming across this observation and acknowledgement in the commentary. The annual Little Gidding Pilgrimage takes place today [Saturday 20 May 2017] and is being led jointly by Canon Tim Alban Jones, chaplain to the Bishop of Peterborough, and Dr Bridget Nichols, for 18 years Lay Chaplain to successive Bishops of Ely, the author of a weekly column in the Church Times on the Sunday lectionary readings, and a member of the Liturgical Commission of the Church of England. The pilgrimage includes the Pilgrimage Eucharist at Leighton Bromswold and Evensong at Little Gidding, with addresses by the pilgrimage leaders at the two services. The complete consort dancing together. The acknowledgment in this book have brought particular pleasure this week. I am not sharing them as I move on as though this were a case of saying ‘These fragments I have shored against my ruins,’ for I am sure that in my new roles I am going to receive many blessings and I am going to be blessed. But I am grateful for these few words, and for the presents and tributes this week too, ‘neither diffident nor ostentatious,’ ‘precise but not pedantic,’ and it was a joy to come across these acknowledgements, however unexpectedly, in a week like this. ● Christopher Ricks and Jim McCue (eds), The Poems of TS Eliot, Volume I: Collected & Uncollected Poems (£40) and The Poems of TS Eliot, Volume II: Practical Cats & Further Verses (£40), London: Faber & Faber, 2015.